Cony, Lawrence return improved teams, but Broncos the favorite again. The Kennebec Valley Athletic Conference Class A should be one of the most competitive leagues in the state again this season, but there’s a recent constant at the top entering the season. Hampden was selected as the favorite in the preseason coaches’ poll. The defending league champion, the Broncos have won the region six of the last eight seasons. “Two through 10, a lot of teams are very closely matched,” Lawrence coach Jason Pellerin. 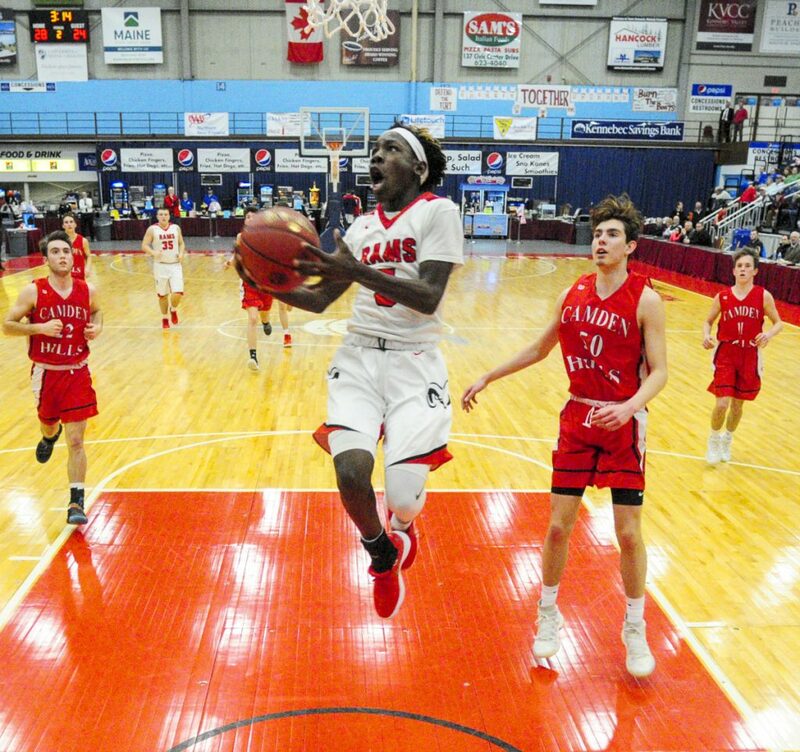 It’s not common for a team to lose its best player and feel good about its chances, but that’s where Cony finds itself even after losing high-scoring guard Jordan Roddy. Why the confidence? A big reason is Simon McCormick, who progressed from freshman role player to a two-way weapon as a sophomore last season. Maines is confident McCormick will continue that growth into one of the KVAC’s best players this season, and returning players like Ian Bowers, Brian Stratton and Dakota Dearborn ensure this is still a team built to win now. Look for let-it-fly shooting and aggressive defense, two Cony staples, to continue. With seven seniors, Lawrence looks to make the playoffs after missing out the last two seasons. Forward Gavin Herrin and guards Kobe Nadeau and Nick Robertson lead the more experienced Bulldogs. “We have good team quickness. The defensive intensity has been good, and we’re playing unselfish,” Pellerin said. Improved scoring is pivotal for the Bulldogs. Entering last season, Lawrence’s returning players averaged a combined 10 points per game. This season, the Bulldogs return 46 points per game. At Erskine, the goals are a postseason berth — and, if the Eagles get a few breaks, a postseason run. The Eagles have size, and they plan on using it. Jacob Praul (6-foot-4) and Gavin Blanchard (6-1) are tough players and fine rebounders inside, and point guard Braden Soule is a distributor who’s proven he can run Erskine’s post-based offense. Skowhegan won 11 games last season, and while the Indians graduated some key players, they return Marcus Christopher. A 6-foot-4 wing, Christopher has the potential to be a 20-10 player each night. “I’d like to think he’s going to be one of the top players in Northern A this year,” coach Tom Nadeau said. Junior Matush Prokop, also 6-4, gives Skowhegan size and scoring potential in the low post. Players such as guard Jimmy Reed, guard Carter Hunt, and forward Tyler Elliott will see increased roles this season. Messalonskee just missed the playoffs lasts season after winning the region in 2017. While the Eagles have no seniors, the younger players gained varsity experience last season that coach Peter McLaughlin thinks will lead to improvement. “We were one win away last year from returning (to the playoffs). We can’t think of the failures of last year. We need to move forward and think of the winning ways this program has established,” McLaughlin said. Junior guard Tucker Charles is a returning starter and a leader to the young Eagles. Sophomore Matt Parent is a strong shooter who started 12 games as a freshman last season. Junior Parker Cole is 6-4 and gives Messalonskee an inside presence. Perhaps no team was hit as hard by graduation as Nokomis. The Warriors lost 1,000-point scorer and conference player of the year Zach Hartsgrove, as well as key players Josh Smestad and Josh Perry. Returning starters Andrew Haining and Brock Graves will be asked to pick up some of the offense lost to graduation. Gardiner lost its entire starting lineup, and new coach Aaron Toman said he’s focusing more on day-to-day improvement than results and records. Senior guard Luke Stevens and junior forward Logan Carlton will lead the Tigers. Mt. Blue has a new coach in Travis Magnusson, who came over from Dirigo, where he helped build a perennial contender in Class C South. Seniors Garrett Reynolds and James Anderson could be a strong backcourt tandem for the Cougars, who will rebuild after a one-win season.